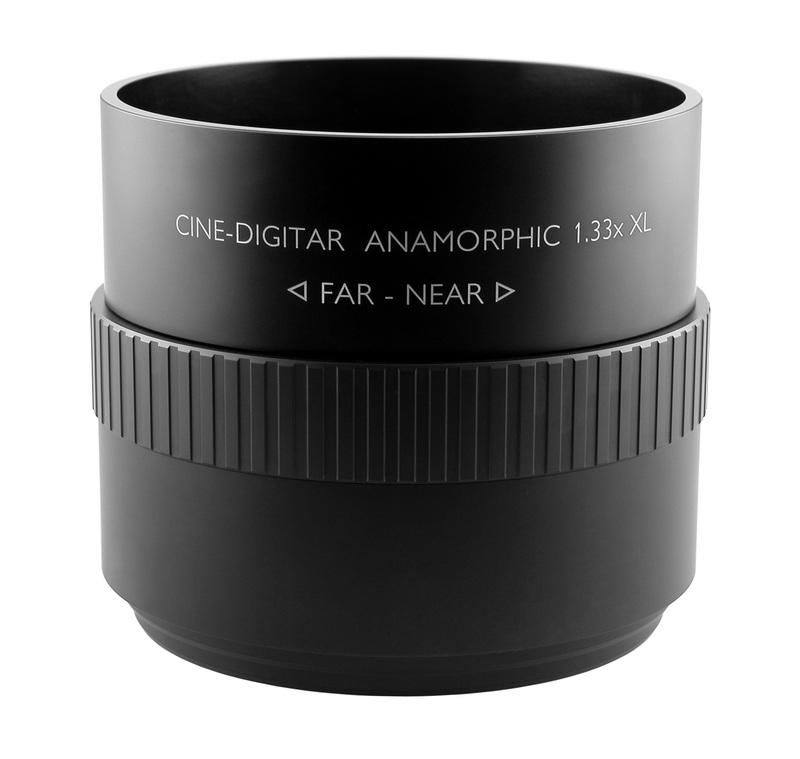 New Schneider Cine-Digitar Anamorphic 1.33x XL Lens tops world's widest line of lenses for home theater Cinemascope® projection. Three Schneider anamorphic lenses are now available for maximum image quality with virtually any size digital projector, lens and screen. The new Schneider Cine-Digital Anamorphic 1.33x XL lens has been designed to meet the needs of home theater owners with large projectors, large-diameter zoom primary lenses, large screen widths and short throw ratios, without the vignetting and shadowing often found at the limits of short throw ratios when using ordinary lenses. By adding the Cine-Digitar 1.33x XL lens to our line, along with the Cine-Digitar 1.33x and 1.33x M, we have created a three-lens selection that covers virtually every wide-screen situation found in home theaters. Schneider Optics, the well known lens and professional filter manufacturer, now enables virtually all digital home theatre owners to achieve incredible full-screen Cinemascope® images and eliminate "letterboxing," regardless of the size of their projector, primary lens or screen. The newest lens -- Schneider Cine-Digitar Anamorphic 1.33x XL -- has been designed to meet the needs of those with large projectors, large-diameter zoom lenses, large screen widths and short throw ratios, without the vignetting and shadowing often found at the limits of short throw ratios when using ordinary lenses. "By adding the Cine-Digitar 1.33x XL lens to our line, along with the Cine-Digitar 1.33x and 1.33x M, we have created a three-lens selection that covers virtually every wide-screen situation found in home theaters." Explained Schneider Optics CEO Dwight Lindsey. "This also provides clear evidence of our strong commitment to the home cinema market overall, and to the dealers and customers who want reliable, high-performance solutions for Cinemascope® movies." Big, bigger, biggest and best home cinema imaging. With the expanded line of Schneider home cinema lenses and lens deployment mechanisms, home theater dealers and installers have an unprecedented wide range of unique full-screen Cinemascope® solutions they can offer their discriminating customers. Placing and removing a Schneider Cine-Digitar lens from the light path in front of a home cinema projector's prime lens is an automatic procedure that is switch activated via a 12-volt trigger or contact closure with any of several Schneider Kino-Torsion or Kino-Linear deployment mechanisms. All feature simple, direct and secure adjustments for displacement, pitch and roll for easy precision lens alignment and are compatible with a wide range of projector-specific mounting brackets. Schneider anamorphic lenses are considered to be the finest in the world by commercial theater owners everywhere. It is very likely that the Cinemascope® movies you have watched in your local theater were projected using a Schneider anamorphic lens. Now, any home theater owner can enjoy the incredible full-screen images provided only by a Schneider anamorphic lens. A wealth of information on digital home theatre is available at http://www.schneideroptics.com, including "PowerPoint Presentations on Home Theatre Anamorphic Conversion" and "A Brief History of Wide-Screen," as well as a "Projector Minimum Throw Ratios Chart" to help determine the optimal projector placement of the Cine-Digitar Anamorphic Lens in any room. 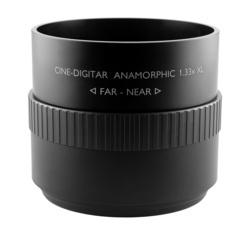 The new Schneider Cine-Digitar Anamorphic 1.33x XL Lens has an MSRP of $8,845 and is available for immediate delivery. Schneider Cine-Digitar lenses set a new standard for lens performance in Digital Cinema and large-venue, high-brightness digital projection applications. They are designed and tested to be brighter, sharper and more uniform than any other lenses for digital projection. All Schneider lenses for digital projection systems are built to the same high standards that have made Schneider lenses for film projection world-renowned for superior sharpness, highly-efficient light transmission, low distortion, and faithful color rendition. For more information contact Schneider Optics, Inc., 7701 Haskell Avenue, Van Nuys, CA 91406 USA. TEL: +1 800 228-1254; FAX: +1 818 505-9865; projection @ schneideroptics.com or visit http://www.schneideroptics.com. To contact Brian Ludvigsen directly call +1 770 241 8810 or email BLudvigsen @ schneideroptics.com. Cinemascope® is a registered trademark of 20th Century Fox Corporation.